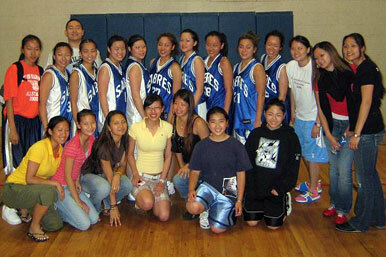 The Womens Liberty division gave 5 teams of young ladies their own special opporunity to shine. Pool play was full of heart pounding competition, as the girls put a year's worth of hard work on display. Following pool play, the top 4 teams advanced to the single elimination Medal Round on Sunday. Up first was the undefeated and oddsmakers favorite NY Sabres Blue v/s the youthful Toronto CCYAA B team. In Saturday's pool play game, the Sabres had taken an 8 point decision but this time the game was an elimination game. The game started off with the Sabres firing on all pistons and with Toronto cold as ice. With roughhouse Maisie Wong (12 points, 3 rebounds) and Tiffany Lee (7 points, 2 steals) scoring at will, NYC was able to take a 14-3 halftime cushion. Jocelyn On (11 pts) got hot in the second half for CCYAA but by then the game was already out of reach and the Sabres marched on 37-20. The other Final Four game turned out to be the most exciting game of the Liberty division. The Philly Lady Suns met up with the Montreal MMAC in a physically grueling matchup. The Suns game is to run, press, and pull the long 3 while Montreal's strengths focus on a halfcourt isolation offense and an intimidating halfcourt D. Montreal played their brand of basketball in the first half as Kim Scarrow (9 points) and Tweety Ho (11 pts, 5 rips) found the mismatches. But Philly was able to stay in the game thanks to Ling Ling Lai's long range shooting (15 pts, 4 threes) and Taylor Lee's postup game (12 points, 4 rebounds). In the second half, the Lady Suns began to wear down Montreal with their full court defense but they could not capitalize at the offensive end. With 6 seconds left and the score tied at 34, MMAC was the fortunate recipient of a controversial foul call and then an equally controversial technical foul for a lane violation. This is the big time, and Montreal showed that they have been practicing their foul shots as they nailed 2 of 5 under pressure to win the game 36-34. The Finals game pitted NY v/s Montreal. The Sabres had won the pool game by 21, and they had plenty of confidence this time around. With the exception of one pool play game where they snuck away with a 2 point win, the Sabres really dominated this division (average margin of victory of 15 ppg). The Championship game was an awesome display put on at both ends of the court by the Sabres. MVP Tiffany Lee (10 points, 2 boards) scored early, Maisie Wong (16 pts) scored often, and Annie Lee (8 pts, 1 steal) scored late to give the Sabres their first ever NACBAIT title 55-28. PG Tweety Ho led MMAC with 10 on a variety of outside pops, free throws, and pullups. Kudos to Tom, Patty, Wilson, and the NY Sabres Blue for a great hoops season.